When it comes to our garage, not many of us really think about making it energy efficient. But an attached garage is one big way that hot and cold air can be entering into our homes. This causes energy bills to rise and your HVAC system to work harder. That's why it's a good idea to make your garage energy efficient—and we've got you covered. Below we have some relatively simple and inexpensive ways to help make your garage more energy efficient. One of the first ways to make your garage energy efficient and save on your energy bill is to start with insulating the door connecting between your home and your garage. Check around the door frame for any gaps and leaks and seal them as needed. Next, put weather stripping around the door frame and install a draft stopper along the bottom of the door along the threshold if it's not sealing properly when shut. As for windows in your garage, also check for any gaps or leaks around the window frame and caulk them as needed. 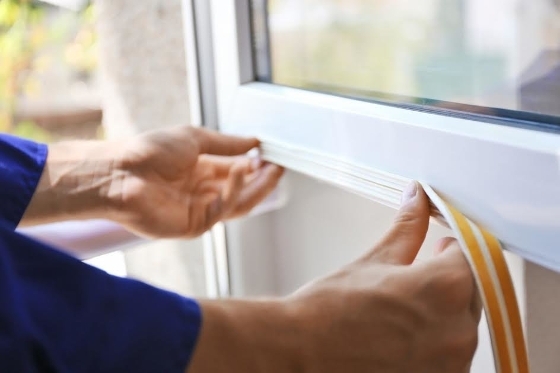 Repair or replace any broken windows, and if the windows are old and not Energy Star certified, consider swapping them out for newer windows with the certification. Check which type of bulb you're using in your garage's overhead light. A 60 watt bulb is usually sufficient for providing enough light. To make it efficient, use an LED or CFL light bulb. To get the equivalent of 60 watts in LED, you'll need a 12-watt bulb and for CFL you'll want a 15-watt bulb. As for your outlets and light switches, installing foam gaskets in them will help to prevent the cold air from entering into the garage. These are easy and inexpensive to install. Cracks in the garage floor are one way that you could be losing a lot of heat since they allow cold air to enter your garage and also let the heat escape. To make it more energy efficient, use a concrete sealant on the floors to help seal the cracks. Also, where your garage walls and floor meet you can be losing heat as well. To fix this, use a foam sealant or a latex or silicone based caulk and run a bead of the sealant where the cement and the wall framing meet. As for your walls and ceiling, adding fiberglass insulation between the joists will go a long way in keeping the heat in and the cold out. For interior walls, the kraft paper side should face the interior wall and for exterior walls, the kraft paper side should be facing the inside of the garage. If your garage has drywall, consider using a blown-in insulation. If there is drywall, be sure to check for any holes that need to be filled in before you blow the insulation in. One of the biggest areas of energy loss may come as no surprise to you: it's your garage door. Some doors come already insulated, but if yours wasn't one of them, you don't have to buy a new door. You can simply buy a garage door insulation kit or use foam board. It won't be as energy efficient as a door that has the insulation built in, but it won't be as expensive as purchasing a new insulated door and will still save you from a lot of energy loss. Along the bottom of the door, install a rubber gasket if there's any gap. Whenever you are checking your home for energy efficiency, don't forget the garage. An energy efficient garage has many benefits, including not only lower energy bills, but also protecting yourself and your family from any potentially toxic fumes you may have from chemicals being stored out there.